Photography and illustrations need to pass our Quality Control (QC) checks. Make sure you check your images before you submit them so you can be confident they’ll pass QC. Have a read of our guide on how to pass QC to avoid them. Most point & shoot, bridge cameras and all mobile phones will struggle to pass our QC checks, you’ll need a camera with a good quality lens and large enough sensor. See our rough guide to digital cameras for more info. All images should be checked at 100% (actual pixels) for correct exposure, colour cast, noise, camera shake and that no sharpening has been applied etc. using professional imaging software. You can shoot or illustrate in whatever format you like, but you’ll need to submit your images to us as JPEGs. Your JPEG file is likely to have a compressed size of 3-5MB. Opening a JPEG in an image program such as Adobe Photoshop will show you the uncompressed/open file size. For more info on QC, see the How we check your images section. We have an additional upload route for collections of reportage or archival images which might not meet our technical standards for regular stock imagery. We have high customer demand for this type of imagery, so if you have a collection then make sure you let us know. What do we mean by reportage images? Photojournalistic images illustrating a story but captured under difficult circumstances and might not pass our standard QC checks. Examples include photo essays or features. What do we mean by archival images? Images that are historically or culturally significant, examples include film stills, press archives and specialist collections. You can apply for Reportage/Archival image upload through your contributor dashboard, or by completing this application form. Newsworthy photography captured within 24 hours of the event has different requirements to stock. To find out more, check out the Live News section. The images must contain Photosphere XMP metadata. Projection type must be Equirectangular. The image must have an exact 2:1 aspect ratio, as it’s uniformly mapping 360° horizontally and 180° vertically. Maximum compressed file size of 200mb. The image must be free of stitching errors and have little optical distortion, with uniformity in luminosity and colours. For your first 360-degree upload, we’ll need you to submit 3 images to pass quality control before you can start to upload larger or smaller batches, even if you’ve already got regular stock images on sale. We currently don’t accept mobile/cell phone stock photography through FTP or Alamy upload but photos taken on a mobile/cell phone can be uploaded via our iPhone app Stockimo. If you take photos on your iPhone and want to make some money, download Stockimo, share your photos and we’ll sell them on Alamy and through our distribution network. There’s lots of information on our help page and over on the Stockimo website. Download Stockimo from the App Store and start uploading now. Previous 2. 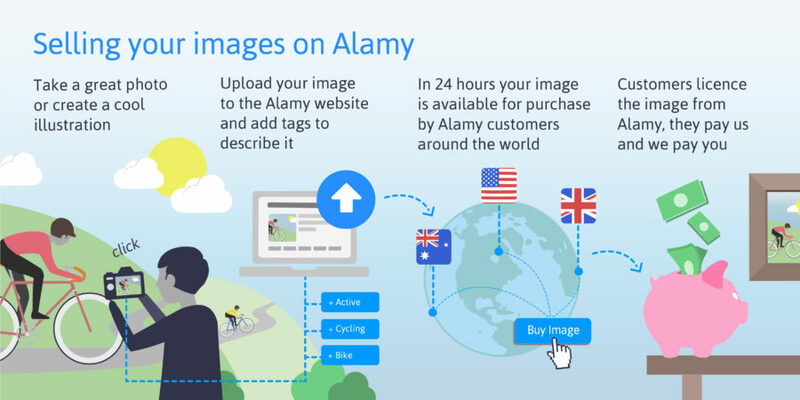 How do I get my images for sale on Alamy? Next 4. How do I send you my stock images?